Islamist fighters have moved the nuns abducted from a convent in the predominantly Christian town of Maaloula to a nearby town held by rebels. The leader of the Orthodox Church of Antioch has called on the international community to help save them. Vatican envoy to Syria, Mario Zenari, said on Tuesday that 12 nuns including the convent’s mother superior had been taken from Maaloula to the rebel held town of Yabroud, some 20 km away. “They forced the sisters to evacuate and to follow them towards Yabroud,” Zenari told Reuters from Damascus by telephone, adding that he did not know for what purposes it had been done. Zenari also said that the nuns were among the last residents remaining in Maaloula after most had fled south to Damascus. On Monday, Syrian state television reported that several nuns had been abducted from the Greek Orthodox Monastery of Mar Thecla after Islamists captured the ancient part of the town and attacked the convent. The Syrian Foreign Ministry sent letters to the head of the UN Security Council and the UN Secretary General urging the international community to condemn the rebel attack on Maaloula and the convent, and to put pressure on the countries supporting the rebels. The Greek Orthodox Patriarch of Antioch and All the East, John X urged the international community on Tuesday to speak up in defense of Syria’s Christians. “We urge the United Nations and all governments to speak out in support of Christians in Syria and to take the steps required to free these nuns from capture,” his statement says. Febronia Nabhan, the mother superior of another convent in Maaloula, said that apart from the nuns, three “young maids” were taken from the convent on Monday. Syrian state television reported that Christians had held a service in Damascus, Monday, to protest against the kidnapping of the nuns as well as for two bishops who were abducted near Aleppo in April. A report by the pan Arabic satellite TV channel Al Mayadeen said that the Syrian soldiers along with local militias were launching an operation to liberate Maaloula. The rebels who attacked the town reportedly came over from the nearby town of Nabak in which Syrian forces are carrying out anti-terrorist operations. The fighting in Maaloula is part of a wider struggle between Al-Qaeda linked fighters of the Nusra Front and the Syrian army for control of the strategic Damascus-Homs highway, which passes close by the town. 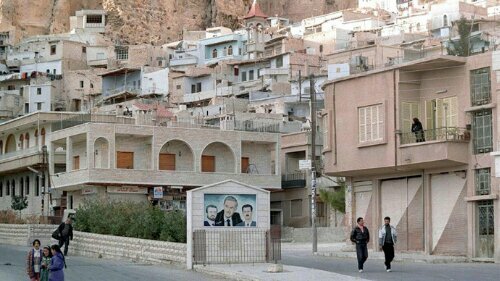 Maaloula was the scene of heavy fighting in September. It is considered to be one of the birthplaces of Christianity and is home to a number of shrines and monasteries, which are listed as UNESCO world heritage sites. Christians, who comprise about 10 percent of Syria’s population, are viewed as supporters of President Bashar Assad, fearing the Islamist ideology of some rebels. This has made them the target of attacks.